Hey guys! i bet you guys weren’t expecting this but i am currently in Korea (screams like a crazy person!). First off, i had to take an international flight to Incheon Airport before taking the train to Gimpo Airport. There are two trains you will see when you follow the signs to the Airport Railroad, as they call it. It is a bit of a distance from where you exit after baggage claims so i would advise that you give yourself 3 hours between both flight. Anyway, there will be an express train and a regular one them being orange and blue respectively. (i’m talking about the colours of the ticketing machine or the signs on it anyways) You should take the blue one if you are proceeding to Gimpo and orange if you are going to Seoul straight. The ride to Gimpo takes about 30mins and a bit more and the flight to Jeju takes about an hour. Upon arrival, you can then proceed to the tourist information right infront of the exit of baggage claims if you need a map, though i have to say the map isn’t the most detailed one and it’s all in Korean. Talking about this, i would like to recommend to anyone going to Jeju to rent a car as long as you have a car liencence (you will need an international driving permit). Jeju doesn’t have the most advance transportation system and if you haven’t properly analysised the bus service, it’s possible to feel very lost, and I mean very very lost. We then made our way to the hotel which was pretty near the airport considering it only costs about 3300 won and took about 10 minutes. We stayed in DecemberJeju hotel. The hotel wasn’t the most luxurious but it served its purpose well along with being pretty hygienic. 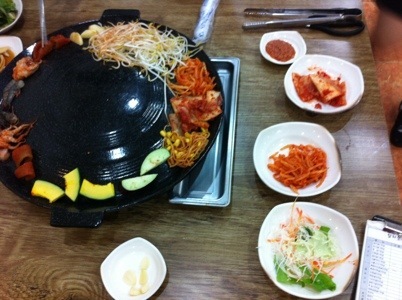 The staff (the 2 i met anyway) are really friendly and can speak English quite well. When we left our hotel, it was already 3pm. We took the airport limo bus to Seogwipo to go to the Jeong Bang waterfalls, which you will come across as being a rather popular site during your research. Because its summer, many Koreans go there to take pictures and dip their feet into the refreshing water in hopes of escaping the heat. It’s not a very time consuming sight and if you think about how far away it is from my hotel, traveling to there took up most of my time. We then took a taxi to the famous Teddy Bear museum which is located within this tourist complex where all the expensive hotels and some attractions are at. The bears were really adorable though it’s true that adults may not enjoy it at much unless you’re a child at heart (like me), you might not find it that enjoyable. Because its really just all sorts of bears on display. 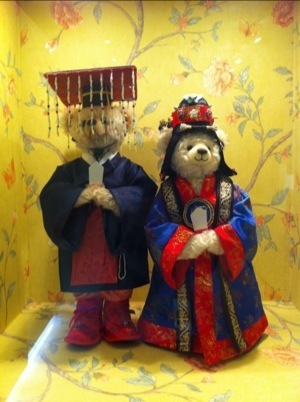 They even had a Goong (Korean drama) corner where they displayed all the bears used in thy show. Jeju) who were just as ensure as me. We came across a barbecue place and boy was I hungry. We ordered beef and pork belly (duh!) and they provided the side dishes. They mainly helped us with it because they probably could tell we were tourists. The food cost about 33000 won which might be a bit more than I would want to pay for, but I found out that that was the standard price. While walking randomly, we came across something like a shopping area which was very near our hotel but easy to miss, somehow. And now my shopping spree starts!